Last time we saw the Diffie-Hellman key exchange protocol, and discussed the discrete logarithm problem and the related Diffie-Hellman problem, which form the foundation for the security of most protocols that use elliptic curves. Let’s continue our journey to investigate some more protocols. Just as a reminder, the Python implementations of these protocols are not at all meant for practical use, but for learning purposes. We provide the code on this blog’s Github page, but for the love of security don’t actually use them. Recall that there are lots of ways to send encrypted messages if you and your recipient share some piece of secret information, and the Diffie-Hellman scheme allows one to securely generate a piece of shared secret information. Now we’ll shift gears and assume you don’t have a shared secret, nor any way to acquire one. The first cryptosystem in that vein is called the Shamir-Massey-Omura protocol. It’s only slightly more complicated to understand than Diffie-Hellman, and it turns out to be equivalently difficult to break. The idea is best explained by metaphor. Alice wants to send a message to Bob, but all she has is a box and a lock for which she has the only key. She puts the message in the box and locks it with her lock, and sends it to Bob. Bob can’t open the box, but he can send it back with a second lock on it for which Bob has the only key. Upon receiving it, Alice unlocks her lock, sends the box back to Bob, and Bob can now open the box and retrieve the message. 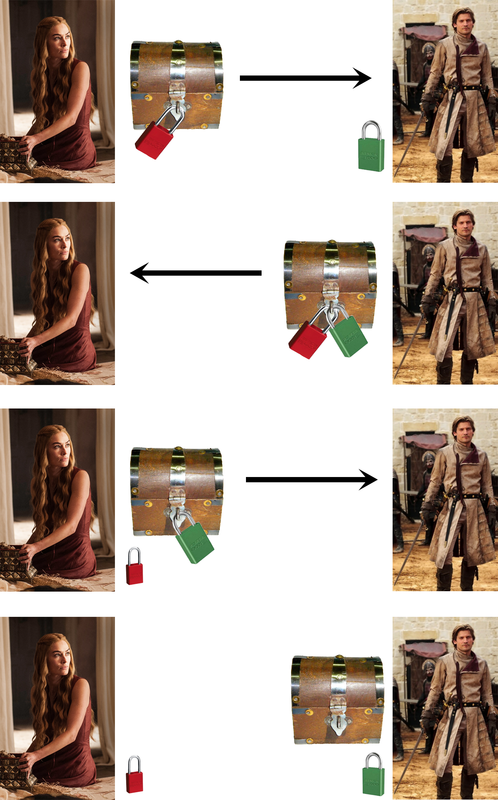 To celebrate the return of Game of Thrones, we’ll demonstrate this protocol with an original Lannister Infographic™. Assuming the box and locks are made of magically unbreakable Valyrian steel, nobody but Bob (also known as Jamie) will be able to read the message. Now fast forward through the enlightenment, industrial revolution, and into the age of information. The same idea works, and it’s significantly faster over long distances. Let be an elliptic curve over a finite field (we’ll fix for some prime , though it works for general fields too). Let be the number of points on . Alice’s message is going to be in the form of a point on . She’ll then choose her secret integer and compute (locking the secret in the box), sending the result to Bob. Bob will likewise pick a secret integer , and send back to Alice. Now the unlocking part: since is a field, Alice can “unlock the box” by computing the inverse and computing . Now the “box” just has Bob’s lock on it. So Alice sends back to Bob, and Bob performs the same process to evaluate , thus receiving the message. Like we said earlier, the security of this protocol is equivalent to the security of the Diffie-Hellman problem. In this case, if we call and , and , then it’s clear that any eavesdropper would have access to , and , and they would be tasked with determining , which is exactly the Diffie-Hellman problem. Now Alice’s secret message comes in the form of a point on an elliptic curve, so how might one translate part of a message (which is usually represented as an integer) into a point? This problem seems to be difficult in general, and there’s no easy answer. Here’s one method originally proposed by Neal Koblitz that uses a bit of number theory trickery. Let be given by the equation , again over . Suppose is our message. Define for any the candidate -points . Then call our candidate -values . Now for each we can compute , and so we’ll pick the first one for which is a square in and we’ll get a point on the curve. How can we tell if is a square? One condition is that . This is a basic fact about quadratic residues modulo primes; see these notes for an introduction and this Wikipedia section for a dense summary. Once we know it’s a square, we can compute the square root depending on whether or . In the latter case, it’s just . Unfortunately the former case is more difficult (really, the difficult part is ). You can see Section 1.5 of this textbook for more details and three algorithms, or you could just pick primes congruent to 3 mod 4. I have struggled to find information about the history of the Shamir-Massey-Omura protocol; every author claims it’s not widely used in practice, and the only reason seems to be that this protocol doesn’t include a suitable method for authenticating the validity of a message. In other words, some “man in the middle” could be intercepting messages and tricking you into thinking he is your intended recipient. Coupling this with the difficulty of encoding a message as a point seems to be enough to make cryptographers look for other methods. Another reason could be that the system was patented in 1982 and is currently held by SafeNet, one of the US’s largest security providers. All of their products have generic names so it’s impossible to tell if they’re actually using Shamir-Massey-Omura. I’m no patent lawyer, but it could simply be that nobody else is allowed to implement the scheme. Indeed, the discussion above raises the question: how does one authenticate a message? The standard technique is called a digital signature, and we can implement those using elliptic curve techniques as well. To debunk the naive idea, one cannot simply attach some static piece of extra information to the message. An attacker could just copy that information and replicate it to forge your signature on another, potentially malicious document. In other words, a signature should only work for the message it was used to sign. The technique we’ll implement was originally proposed by Taher Elgamal, and is called the ElGamal signature algorithm. We’re going to look at a special case of it. So Alice wants to send a message with some extra information that is unique to the message and that can be used to verify that it was sent by Alice. She picks an elliptic curve over in such a way that the number of points on is , where is a small integer and is a large prime. Let Alice’s message be represented as an integer at most (there are a few ways to get around this if your message is too long). Now to sign Alice picks a message specific and computes what I’ll call the auxiliary point . Let . Alice then computes the signature . The signed message is then , which Alice can safely send to Bob. Now to analyze the security. The attacker wants to be able to take any message and produce a signature that will pass validation with Alice’s public information. If the attacker knew how to solve the discrete logarithm problem efficiently this would be trivial: compute and then just sign like Alice does. Without that power there are still a few options. If the attacker can figure out the message-specific integer , then she can compute Alice’s secret key as follows. Given , compute . Compute , and you know that this congruence has only possible solutions modulo . Since is less than , the attacker can just try all options until they find . So that’s bad, but in a properly implemented signature algorithm finding is equivalently hard to solving the discrete logarithm problem, so we can assume we’re relatively safe from that. On the other hand one could imagine being able to conjure the pieces of the signature by some method that doesn’t involve directly finding Alice’s secret key. Indeed, this problem is less well-studied than the Diffie-Hellman problem, but most cryptographers believe it’s just as hard. For more information, this paper surveys the known attacks against this signature algorithm, including a successful attack for fields of characteristic two. We can go ahead and implement the signature algorithm once we’ve picked a suitable elliptic curve. For the purpose of demonstration we’ll use a small curve, over , whose number of points happens to have the a suitable prime factorization ( ). If you’re interested in counting the number of points on an elliptic curve, there are many theorems and efficient algorithms to do this, and if you’ve been reading this whole series something then an algorithm based on the Baby-Step Giant-Step idea would be easy to implement. For the sake of brevity, we leave it as an exercise to the reader. Note that the code we present is based on the elliptic curve and finite field code we’re been implementing as part of this series. All of the code used in this post is available on this blog’s Github page. So far so good. Note that we generate the message-specific at random, and this implies we need a high-quality source of randomness (what’s called a cryptographically-secure pseudorandom number generator). In absence of that there are proposed deterministic methods for doing it. See this draft proposal of Thomas Pornin, and this paper of Daniel Bernstein for another. Now to authenticate, we follow the procedure from earlier. Continuing with our example, we pick a message represented as an integer smaller than , sign it, and validate it. So there we have it, a nice implementation of the digital signature algorithm. Now we have something of the form , and similarly to the attack described earlier we can try all possibilities until we find a number that satisfies . Then once we have we have already seen how to find . Indeed, it would be a good exercise for the reader to implement this attack. The attack we just described it not an idle threat. Indeed, the Sony corporation, producers of the popular Playstation video game console, made this mistake in signing software for Playstation 3. A digital signature algorithm makes sense to validate software, because Sony wants to ensure that only Sony has the power to publish games. So Sony developers act as one party signing the data on a disc, and the console will only play a game with a valid signature. Note that the asymmetric setup is necessary because if the console had shared a secret with Sony (say, stored as plaintext within the hardware of the console), anyone with physical access to the machine could discover it. Now here come the cringing part. Sony made the mistake of using the same to sign every game! Their mistake was discovered in 2010 and made public at a cryptography conference. This video of the humorous talk includes a description of the variant Sony used and the attacker describe how the mistake should have been corrected. Without a firmware update (I believe Sony’s public key information was stored locally so that one could authenticate games without an internet connection), anyone could sign a piece of software and create games that are indistinguishable from something produced by Sony. That includes malicious content that, say, installs software that sends credit card information to the attacker. So here we have a tidy story: a widely used cryptosystem with a scare story of what will go wrong when you misuse it. In the future of this series, we’ll look at other things you can do with elliptic curves, including factoring integers and testing for primality. We’ll also see some normal forms of elliptic curves that are used in place of the Weierstrass normal form for various reasons. Finding solutions to systems of polynomial equations is one of the oldest and deepest problems in all of mathematics. This is broadly the domain of algebraic geometry, and mathematicians wield some of the most sophisticated and abstract tools available to attack these problems. 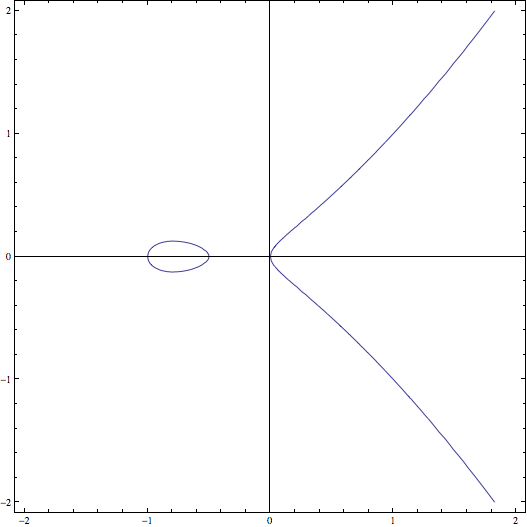 The elliptic curve straddles the elementary and advanced mathematical worlds in an interesting way. On one hand, it’s easy to describe in elementary terms: it’s the set of solutions to a cubic function of two variables. But despite how simple they seem deep theorems govern their behavior, and many natural questions about elliptic curves are still wide open. Since elliptic curves provide us with some of the strongest and most widely used encryption protocols, understanding elliptic curves more deeply would give insight into the security (or potential insecurity) of these protocols. Our first goal in this series is to treat elliptic curves as mathematical objects, and derive the elliptic curve group as the primary object of study. We’ll see what “group” means next time, and afterward we’ll survey some of the vast landscape of unanswered questions. But this post will be entirely elementary, and will gently lead into the natural definition of the group structure on an elliptic curve. One would naturally ask, “Who the hell came up with that?” A thorough answer requires a convoluted trip through 19th and 20th-century mathematical history, but it turns out that this is a clever form of a very natural family of equations. We’ll elaborate on this in another post, but for now we can give an elementary motivation. We might wonder when it’s the case that we can rearrange these spheres into a single square. Clearly you can do it for a pyramid of height 1 because a single ball is also a 1×1 square (and one of height zero if you allow a 0x0 square). But are there any others? Here is a graph of this equation in the plane. As you admire it, though, remember that we’re chiefly interested in integer solutions. The equation doesn’t quite have the special form we mentioned above, but the reader can rest assured (and we’ll prove it later) that one can transform our equation into that form without changing the set of solutions. 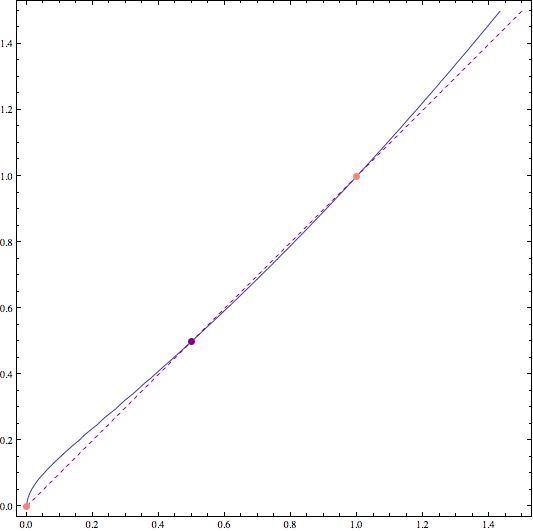 In the meantime let’s focus on the question: are there any integer-valued points on this curve besides and ? The method we use to answer this question comes from ancient Greece, and is due to Diophantus. The idea is that we can use the two points we already have to construct a third point. This method is important because it forms the basis for our entire study of elliptic curves. And it’s , giving the point since the line was . Because of the symmetry of the curve, we also get the point . Here’s a zoomed-in picture of what we just did to our elliptic curve. We used the two pink points (which gave us the dashed line) to find the purple point. Great! Here’s another picture showing what we just did. In reality we don’t care about this little puzzle. Its solution might be a fun distraction (and even more distracting: try to prove there aren’t any other integer solutions), but it’s not the real treasure. The mathematical gem is the method of finding the solution. We can ask the natural question: if you have two points on an elliptic curve, and you take the line between those two points, will you always get a third point on the curve? Certainly the answer is no. See this example of two points whose line is vertical. But with some mathematical elbow grease, we can actually force it to work! That is, we can define things just right so that the line between any two points on an elliptic curve will always give you another point on the curve. This sounds like mysterious black magic, but it lights the way down a long mathematical corridor of new ideas, and is required to make sense of using elliptic curves for cryptography. Before we continue, let’s take a little detour to get a good feel for the shapes of elliptic curves. We have defined elliptic curves by a special kind of equation (we’ll give it a name in a future post). During most of our study we won’t be able to make any geometric sense of these equations. But for now, we can pretend that we’re working over real numbers and graph these equations in the plane. The problem is when we cross the point at which the rounded part pinches off in the first animation, and the circular component appears in the second. At those precise moments, the curve becomes “non-smooth” (or singular), and for reasons we’ll see later this is bad. The condition from the beginning of the article (that ) ensures that these two cases are excluded from consideration, and it’s one crucial part of our “elbow grease” to ensure that lines behave nicely. 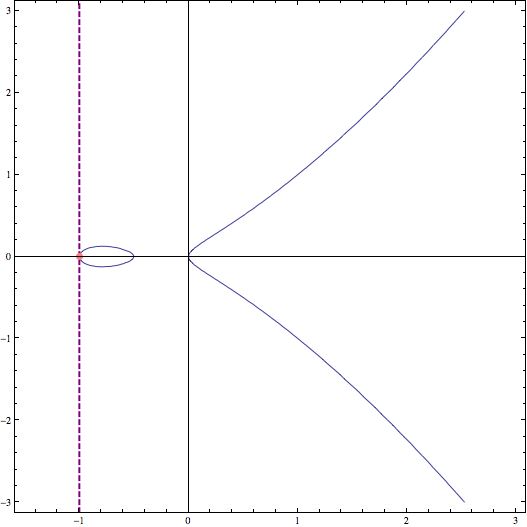 The “canonical” shape of the elliptic curve is given by the specific example . 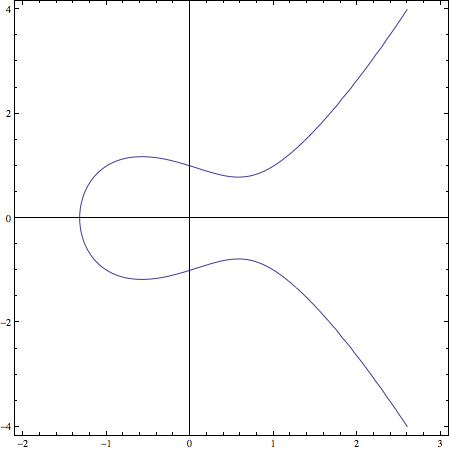 It’s the example that should pop up whenever you imagine an elliptic curve, and it’s the example we’ll use for all of our pictures. So in the next post we’ll roll up our sleeves and see exactly how “drawing lines” can be turned into an algebraic structure on an elliptic curve.